Liberty enlightening... the Butler police station? 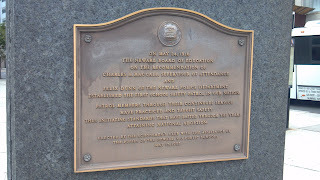 Our recent visit to Butler brought about a somewhat puzzling find; one that led me to discover a little known link between the borough and the great New York Harbor. They're both home to the Statue of Liberty. Yup, you read that right. 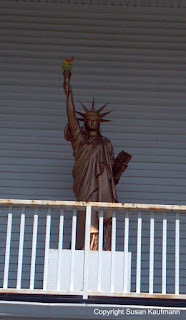 Lady Liberty surveys downtown Butler from the balcony of the police station. Now, don't get me wrong. I love the statue as much as the average American, maybe even more. I still cling to the belief that she stands in New Jersey, despite a 1998 Supreme Court decision that upheld the bi-state compact that deemed Liberty Island to be within New York borders. 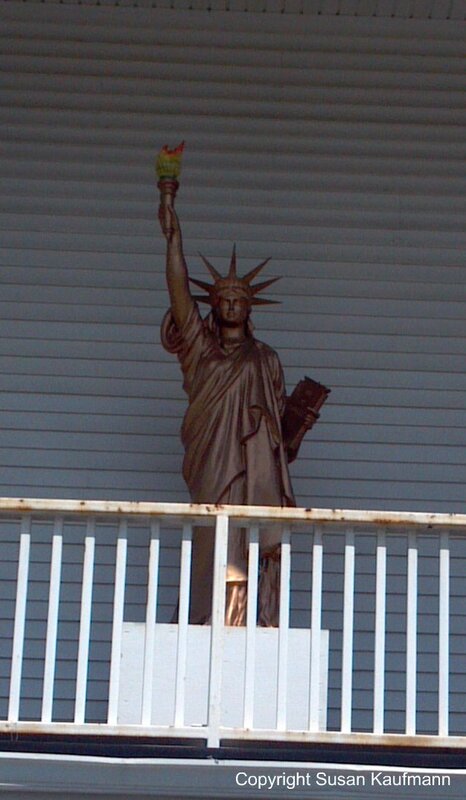 Other New Jerseyans feel so strongly about her that they've erected their own renditions of her on their property. However, I have never seen a copy of the statue on public property. Why Butler? I mean, it's a perfectly nice town, and I'm not saying they aren't entitled to a Statue of Liberty, but what's the special significance for that community? The answer may come from a long ago friendship. The town's namesake, business executive Richard Butler, was an art lover and was one of the founders of New York's Metropolitan Museum of Art. Among his friends was Frederic Bartholdi, sculptor of the Statue of Liberty that stands in New York Harbor. My guess is that the statue somehow memorializes that friendship, giving the town their tenuous but clearly prized relationship to Liberty Enlightening the World. There's even a Bartholdi Avenue in town, making it even more certain, in my mind, at least, that the local statue is no coincidence. We didn't try to see if we could get closer to the Butler version to check it out -- it's at the police station, after all -- but it looked pretty authentic. Except for the color, that is. Perhaps she was erected to celebrate the 100th birthday of her counterpart in the Harbor? 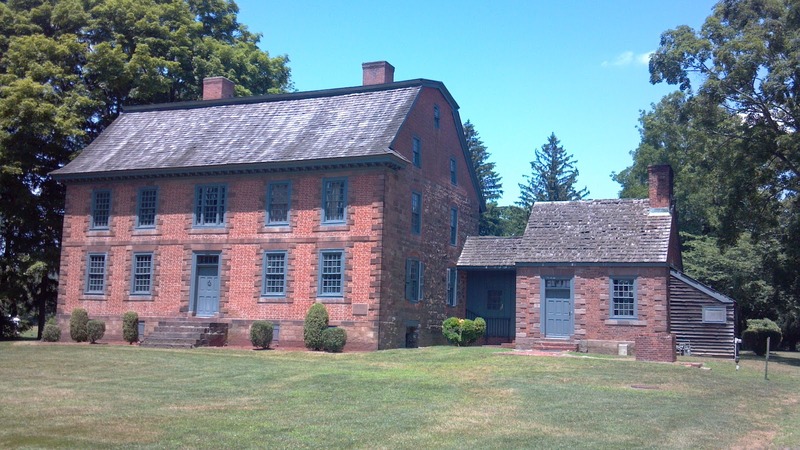 I've long known Butler as a small, quiet borough near Route 23 in Eastern Morris County, but it wasn't until we stopped there one Sunday that I realized the role it played in what was once a prominent industry in the state. Much of the town's small business district is dominated by a large industrial building standing hard against the railroad tracks. In fact, it appears as if the town center might have been built around the mill-like structure. Little did we know that we were gazing upon yet another milestone in the annals of New Jersey industrial history: the site of the world's oldest manufacturer of hard rubber products. 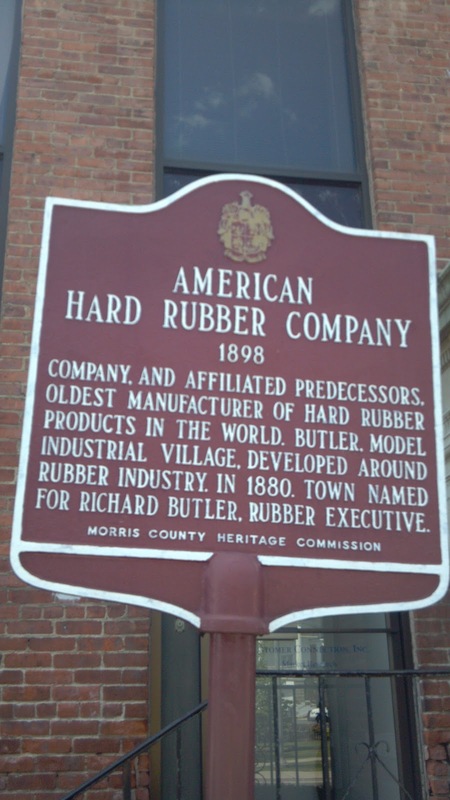 Richard Butler bought the Newbrough Hard Rubber Company already operating in town and eventually combined it with others to create the American Hard Rubber Company in the late 1800s. Through his vision, the community grew exponentially, with hundreds of workers coming to live near the factory that provided them with jobs. The municipal website says that the Butler Rubber Mill was once the largest manufacturing facility of its kind in the world. 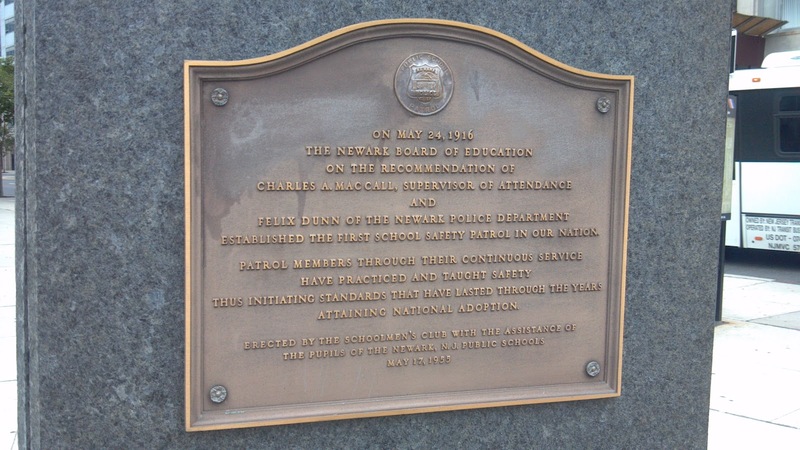 I'd never really connected the dots before, but it seems that New Jersey has a bit of a rubbery past that extends well beyond Butler. According to the Encyclopedia of New Jersey, New Brunswick was the site of one of the country's first rubber factories, built in 1838 by Horace Day. It might also be considered an early recycling venture: the facility manufactured rubber shoes using alcohol, white lead, lampblack and rubber salvaged from imported Brazilian shoes and syringes. Charles Goodyear later successfully sued Day for copyright infringement when the New Jerseyan claimed to have been the first to vulcanize rubber to make it more durable. 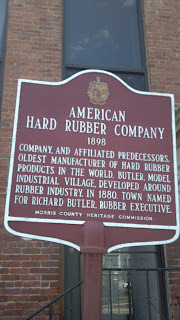 In spite of Day's setback and the movement of much of the industry to Akron, Ohio, the state continued to play a prominent role in rubber. Milltown already had a sixty-plus year history in rubber manufacturing when Michelin came to town in 1907, adding a decidedly French influence to the community. Its workers produced over 4500 tires and 15,000 inner tubes a day, until the plant closed in 1930. Never one to pass on a challenge, Thomas Edison even took a crack at the rubber business in the later years of his life. The breadth and severity of World War I prompted Henry Ford and tire magnate Harvey Firestone to be concerned that future conflicts could curtail the import of South American raw rubber to the United States. Certainly their friend Edison could come up with an alternative? Many people don't realize that Edison loved chemistry and took great pleasure in experimenting in his lab. In what was destined to be his final project, he set about to derive rubber from the goldenrod, first by hybridizing the plant. His experimentation resulted in taller stalks that yielded more natural rubber than the average plant, yet the actual product failed to meet the desired standard. The U.S. Department of Agriculture continued his work after his death but finally closed the project in 1934, without a positive result. Butler's rubber industry declined first with the massive 1957 fire at the Pequanock Rubber Company, and finally with the closure of the last factory in the 1970s. The original product may be gone now, but the town can be proud of its contributions to American industry. One of these days I'm going to put together a "Washington slept here" map of all of the locations where the General stayed in New Jersey during the Revolutionary War. Some say that he spent more time in the state than anywhere else during the fight for independence, and if our recent travels are any indication, that assertion is totally correct. Dey Mansion in Wayne is a case in point. An impressive brick Georgian mansion with Dutch influences, the home was Washington's headquarters for much of the months of July, October and November 1780. 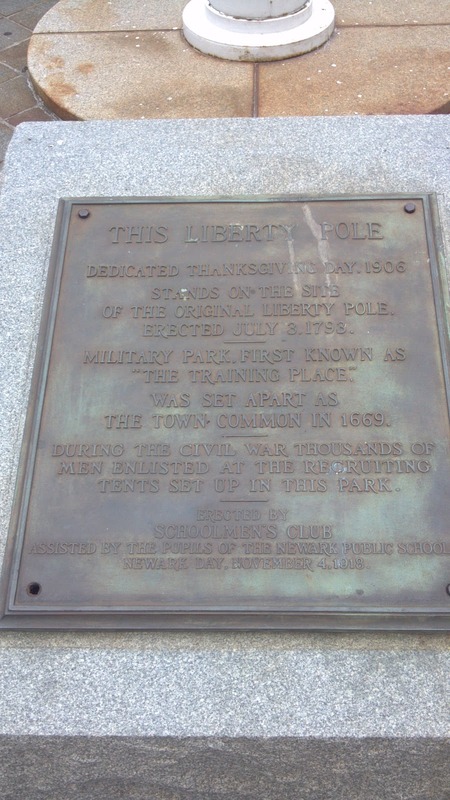 To put that into context, the first stay was just a few weeks after the battles of Connecticut Farms and Springfield which, repelled the British from capturing the General at Morristown. 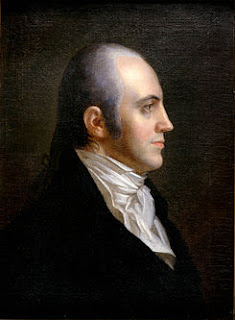 The second stay was just after Major General Benedict Arnold and his accomplice Major John Andre were revealed to be traitors. When we visited the Hermitage a few weeks ago, we learned that Theodosia Prevost offered her home as a battle headquarters in the hopes of currying favor with Continental military leaders. That led me to wonder how the Dey mansion came to host Washington. Was the family sympathetic to the cause, or did they have more pragmatic reasons for offering up their house? Family background indicates the former. The Dey family had been in North America for well over a century before the Revolution. Dirck Janszen Siecken Dey came to New Amsterdam from the Netherlands around 1641 as part of the Dutch West Indies Company, and his descendants arrived in the Preakness Valley of New Jersey in the early 1700s. The mansion we see in Wayne was built sometime between 1745 and 1775, either by Theunis Dey or his father, who was named Dirck, like the original New World settler. Theunis was a prominent citizen, acting as a freeholder in what was a much larger Bergen County, representing the county in the State Assembly, and serving as a trustee of the very young Queen's College (or as we know it now, Rutgers University). He was also a colonel in the Bergen County militia, and thus was in close contact with military leaders, including the Commander in Chief himself. Not far from the Passaic Falls, the mansion's location was deemed a suitable place for Washington to both set up headquarters and be sheltered from repeated British kidnap attempts. Ivan and I visited the mansion on a hot, sunny day, and the docent warned us that the house was warm and stuffy, so we'd be skipping the third floor portion of the tour (they'll be adding climate control later this year during a major restoration effort). I rationalized that we'd get a sense of the conditions during Washington's stay, without the heavy uniforms, of course. The mansion is laid out in classic Georgian fashion, with each floor boasting a generous center hall and two decent-sized rooms on each side. However, the Dutch influence is revealed in the placement of the stairs, which start at the back-end of the house and rise to the top of the next floor, all concealed from view. After Ivan noted that the stairs seemed especially sturdy and level, the docent explained that one of the Deys was an accomplished carpenter who'd made sure to use strong oak beams to support the floors. Washington and his staff used two rooms on each floor, leaving Theunis Dey and likely more than a dozen family members to the remaining two. The center halls on both floors are wide enough to serve as rooms themselves, and likely were used as dining areas. Though bathing and toilet facilities were understandably not part of the layout, it's not hard to imagine a modern-day family living there comfortably. While there are no artifacts used by Washington himself, the furniture, housewares and personal items reflect the items that were likely in the house during his stay. It's not hard to imagine various officers gathering in the downstairs sitting rooms, reading dispatches that had just been delivered by couriers at the side door of the house. Our docent noted that the General had written prodigiously during his stay, penning nearly 600 pages of correspondence and orders. It's a bit more challenging to visualize how the Dey family managed with so many guests and so much activity going on around them. On one hand, it must have been exciting to host Washington and other luminaries like the Marquis de Lafayette and Alexander Hamilton. On the other hand, the presence of even the quietest of houseguests can grow tedious the longer they're around. Battle for independence or not, some folks wouldn't be very well suited to give up half their house to a bunch of relative strangers. Regardless, our visit exposed us to another dimension of life in New Jersey during wartime and the various machinations Washington went through to avoid capture. It's really fascinating how the more I wander around the state, the more complex and interesting our role in the Revolution becomes. One more non-historic note: admission to the Dey Mansion is a more than fair $1 per person. Yes, a Washington will get you in to see Washington's headquarters. It's a real bargain! Be sure to check it out before it closes for renovation in the fall. You know it's going to be a good birding day when you spot two bald eagles on a transmission pole on the side of the Garden State Parkway at 7 a.m.
July is not the best month to go birding. 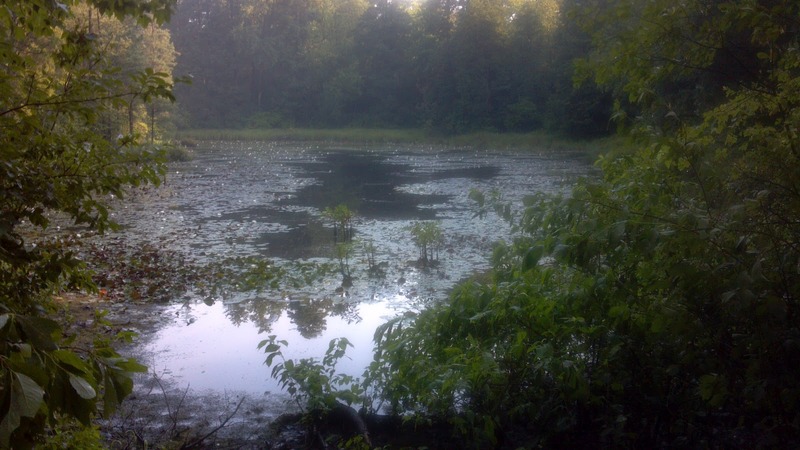 As I mentioned when describing our Glassboro jaunt, it's both humid and fraught with the perils of greenhead flies, neither of which rank among my top ten reasons to spend time in the great outdoors. Still, though, it seemed as if Forsythe NWR, a.k.a. Brig, was our destination for the day. It was easily the most significant birding hotspot listed on the state rare bird alert issued just before the weekend. Ivan and I left Hidden NJ headquarters at o'dark thirty and were at the Galloway Wawa by 7:15, having seen the aforementioned eagles just north of exit 48. The target bird for the day was the white-faced ibis, which had been reported to be at Brig a few days before, plus whatever interesting shorebirds made their appearance. It didn't take long for us to find something interesting. Several glossy ibis were around, allowing me to say, "Ibis in the morning" like an adenoidal morning radio host. Then, however, Ivan spotted a common moorhen nearby, an unexpected bonus and a life bird for me. As I watched, it neared the birds we'd already called. "Nice!" I observed, "it's in the same field of vision with the ibis!" "Ibis and the moorhen," Ivan observed, to the tune of the same morning radio show. Obviously it was going to be a bad pun day. The route around the impoundment marshes gave us a nice selection of shorebirds, plus a bonus snow goose that must have missed the memo to head northward for the summer with the rest of his flock. He seemed to be trying to ingratiate himself with the larger Canada geese who apparently wanted little to do with him. The birds on the water scattered en masse at a point, a sure sign of a predator overhead. We watched as a bald eagle, our third for the day, circled overhead and then landed in the shallow water to fish. With his ample dark leg feathers showing clearly through the viewing scope, he looked like an old man in waders, poking around. Further marsh views brought us yellowlegs, assorted terns and a bonus blue grosbeak, but the real treat awaited us a little farther inland. The one-way driving route brings visitors past the interestingly-named Experimental Pool, a term that always puts me in the mind of three-eyed fish but describes, in fact, a very nice little marshy pool. We never seem to see anything there -- even typical stuff -- but we always make the stop, just in case. "Black-bellied whistling duck!" he exclaimed. I trained my binoculars on it as he ran back to grab his scope for a closer look, and suddenly the brown leaf next to the duck gained a neck and a head just like the other. It wasn't a single rare sighting, but two -- a pair of black-bellied whistling ducks! These folks have ventured far away from their usual breeding homes in Texas. A pair had been sighted near the Cape May lighthouse in 2011, but we were apparently the first birders to see the species in New Jersey this year. 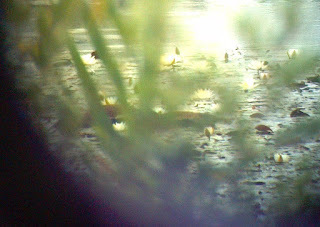 Quickly returning and setting up the scope, Ivan got a closer focus on the birds and confirmed it. The chestnut colored back, whitish wing stripe, black underside and red bill unquestionably qualified them as black-bellied whistling ducks. We definitely needed to let the birding community know, but photographic evidence would make the sighting that much more certain for others. Just our luck, I hadn't brought my good camera; all we had available to us was my smartphone. Perhaps if we aimed it through the scope, we'd get something good. See those brownish shapes toward the middle of the photo? Those are the black-bellied whistling ducks. Fortunately we found the nearby Atlantic County library via GPS so Ivan could use their computer to report the sighting online quickly. Other birders then heard about our find in sufficient time to visit the Experimental Pool and make the sighting for themselves before the birds left the location. (In fact, an intrepid Hidden New Jersey reader reported seeing them just a few hours after we did.) Since then, the ducks have been sighted elsewhere in the refuge, and better photos than mine have been taken for documentation purposes. Needless to say, I'll be bringing my camera the next time we go to Brig! Anyone who's lived in the state a while knows that there are cultural differences between North and South Jersey. Many of the variances are related to foods. You eat a sub sandwich in the North, while it's a hoagie down South. Some of us call the candy topping for ice cream "jimmies" while others say "sprinkles." Then there's the great Wawa/Quick Chek debate. Thing is, I've always assumed that people still recognize the 'other' term for a food, even if they don't describe it that way themselves. How many of us have been strongly corrected for using the 'wrong' expression for something when we're out of our home region? That takes a level of awareness. And in this age of rampant communication, how could someone not be aware of alternate names? That's what I thought before the great Taylor ham debacle. Ivan and I had built up quite an appetite during our visits to Hollybush and Glassboro WMA, so when we found a decent-sized diner in Mullica Hill, we headed in, sat at the counter and ordered. Having only some fruit before we'd left the house around 5:30 a.m., I figured I'd get a substantial breakfast at midday: two scrambled eggs with toast and home fries, plus a side of Taylor ham. 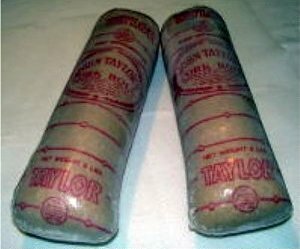 I'd seen pork roll listed as an option, and my brain automatically translated it to Mr. Taylor's spiced pork product. I didn't even think about it. Taylor ham: the disputed pork product. ...until she shows up with my eggs with toast and home fries on a platter, and a slab of ham on a small plate. "Uh, I asked for Taylor ham," I said, courteously but obviously not pleased. "This is the only kind of ham we have," she said, equally as politely. "Taylor ham," I insisted. "I saw it on the menu." Then the light switch went on in my head. Ohhhhhhhh! "Pork roll," I clarified. We were in South Jersey, but I never, ever thought I'd have to explain Taylor ham to a diner waitress anywhere in New Jersey. She confessed that she'd thought I was looking for a particular brand of ham, so she hadn't asked for clarification. I guess she figured I wouldn't know the difference, but we weren't talking Hormel vs. Shop Rite here. After we I worked it out and mutually apologized for the confusion, another waitress came by. She told me she'd heard the whole exchange and knew what I was talking about because she'd heard about Taylor ham from some people from "up north." Apparently a bi-regional translator, she noted that she often had to explain scrapple to people north of the Philly region. I checked a nearby menu and confirmed my error: they offered pork roll, not Taylor ham. So, yeah, it was my bad, but really, isn't it reasonable to expect that a diner employee would have heard of Taylor ham, no matter where she lived in the state? The famed North/South Jersey researcher Steve Chernoski addressed the pork roll debate in his blog, Where is the Line Between North and South Jersey. According to his research, "Taylor ham" is a term used only in seven and a half counties (with Warren suffering the split) on the northern end of the state, with my home county of Union being the southernmost. I could swear I used to enjoy Taylor ham and cheese sandwiches at the Cook College student center in New Brunswick, but they might have split the difference and called it Taylor pork roll. I guess I'm going to have to concede this one. And read diner menus a lot more carefully from now on. Today I'm putting my feet up and passing my usual writing duties to the often-written-about Ivan, to tell us a bit about a well-known Morris County personage who's not normally associated with New Jersey. Take it away, Ivan! Well, it had to happen eventually. After a year and a half of traveling around with Sue, I’m finally contributing a post to Hidden New Jersey. Alert readers may recall that I am an avid student of the Civil War. In addition, Major League Baseball’s 2012 All Star Game will be played tonight. You may be asking “How can he possibly relate New Jersey, baseball and the Civil War?” The answer is quite simple: Abner Doubleday, the man probably best remembered for the fallacious story of his inventing baseball. In his upstate New York youth, Doubleday did play baseball and some historians contend that he had a hand in codifying some of the rules in those early days of the game. However, he was actually a military man and is buried in Arlington National Cemetery. While walking around the cemetery some years ago, I heard a tour guide point out his grave, mentioning the baseball legend but omitting the reason that Doubleday lies at rest in the nation’s most prestigious military cemetery. Doubleday graduated West Point in 1842 and fought in both the Mexican and Seminole wars, rising to the rank of captain. In 1861 he was serving at the garrison at Fort Sumter in Charleston Harbor when Confederates fired on the fort, thus starting what was to become the bloodiest war in American history. He is often credited with firing the first Union shot of the war in response to the Confederate bombardment. On July 1, 1863, Major General Doubleday figured prominently in the Union defense on the first day of the Battle of Gettysburg. Although modern historians generally look upon his performance favorably, Union commander George Meade replaced him with John Newton on the second day of the battle, thereby creating ill feelings between the two men for the rest of their lives. Doubleday died in Mendham on January 26, 1893 with no word on whether he found his religious Truth. Although some internet sources say he suffered from heart failure, I was fortunate to find an original obituary which indicates his death as being the result of Bright’s disease, a kidney ailment. 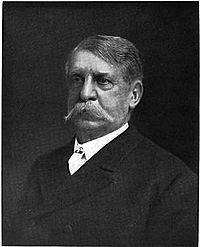 No matter what the cause of death, Doubleday certainly lived out his final years in the Garden State, thereby adding to New Jersey’s intimate association with baseball history. From history’s first recorded baseball game (in Hoboken) to the source of the special secret baseball rubbing mud and the home of the world’s only Phil Rizzuto museum, we’ve got strong ties to the national pastime. 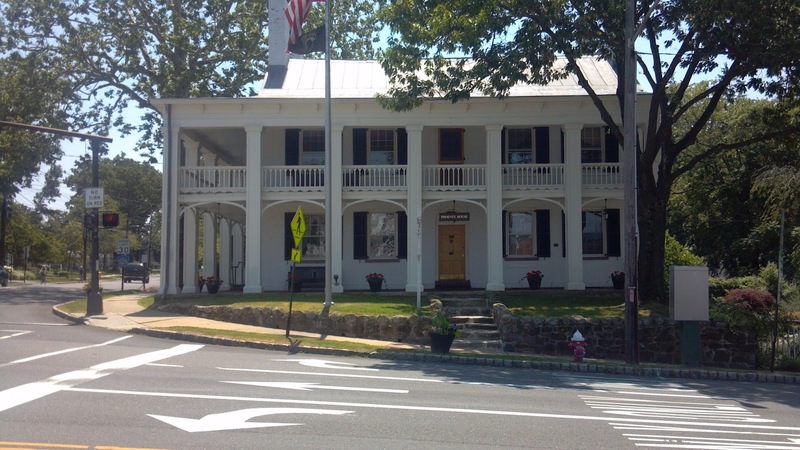 As for Mendham, bits and pieces of Doubleday still remain. Phoenix House, where he stayed while his own home was being built, still stands on Main Street, but his Hilltop Road house no longer stands. Residents have honored him with a namesake athletic field several blocks away, on Mountain Avenue, and the marker notes his military service along with his reported contribution to baseball. This is a somewhat tough time of year for birders. The birds have gone quiet, for the most part, after putting on their best plumage and singing their hearts out to find the loves of their lives (or at least the season). Many are getting their young to fledge so they can start their second brood, so while you might see some nice young 'uns, Moms and Dads are primarily too busy to make themselves known to humans. Add to that our recent bouts of 90+ degree heat, and you can see the dilemma. For Ivan it's become less a matter of finding numbers of birds than it is the hunt to spot particular species. A couple of recent out-of-state trips scored a lot of sightings he wouldn't normally have gotten so early in the year, leaving a few stragglers yet to be found. Those birds tend to hang out in places best avoided in the heat of summer. I knew we were tempting fate when I agreed to his suggestion that we head to Gloucester County and Glassboro Wildlife Management Area. The Guide to Bird Finding in New Jersey suggests it's a premier place to spot the Kentucky, hooded and pine warblers that remained on Ivan's 'wanted' list for 2012, so off we went. 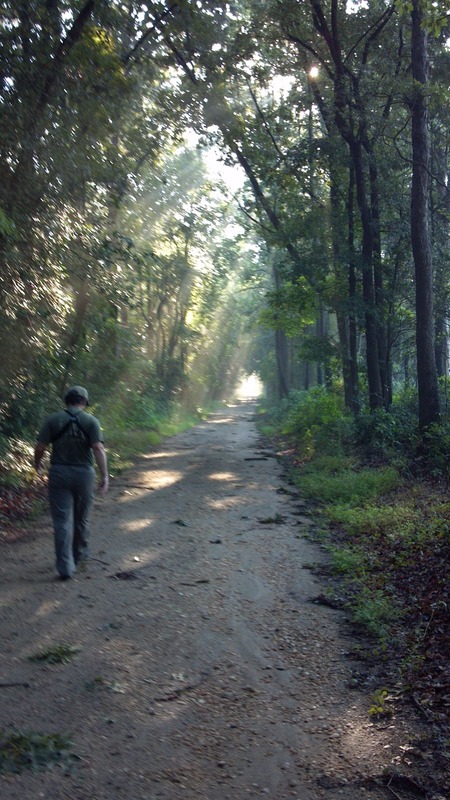 Never mind the fact that my internal radar always steers me away from tromping around the Pinelands in mid-summer, lest I be consumed by mosquitoes and green headed flies. Other than one really poorly advised trip to Bivalve a few years ago, I tend to avoid most moist natural spots south of Trenton and west of the Parkway during July and August. They're just too buggy. Glassboro Woods is pretty much the textbook example of deciduous wetland. We left home base early enough to get us to Glassboro by about 7:30 a.m. The WMA entrance isn't marked by signs; rather you have to find the proper sandy dirt road and drive down a piece, until you reach a pipe gate blocking further transit. Once we got there, we parked in a small clearing to the side of the road, doused ourselves in bug repellent and aimed a few prayers upward for mercy. The greenheads started circling almost immediately after we left the car, but the sight ahead of us on the broad path immediately distracted me from the pests. Early-morning sunlight streamed through the forest canopy, looking very much like an inspirational poster. We weren't hearing too much bird activity, but perhaps it was farther in. We continued walking along the wide path, happy not to have to worry about brushing against possibly tick-infested underbrush. The previous night's rainstorm had left the road damp and pocked with puddles in places, but for the most part it was very amenable. When we reached an intersection with another path, we made the turn. Again, it wasn't all that noisy, but we ran into a white-eyed vireo and eventually a towhee, both singing for attention. A power line cut didn't offer much in the way of spotting -- if memory serves, it was downright quiet. Perhaps we weren't seeing many birds, but the puddles seemed to be making up for it with frogs. A few surprised us by popping up just before we stepped over some water-filled potholes. Even more amusing, very young ones, barely bigger than my thumbnail, quickly made their way across the path with some impressively long hops. I almost wanted to pick one or two up, they were so cute, but I resisted, letting them continue on their way undisturbed. After a couple of hours of largely unsuccessful bird wandering, we turned back toward the car. When we got to our original turnoff spot, though, Ivan suggested we check out the area we would have seen earlier, had we not made the detour. Can't hurt, right? A quarter-mile walk brought us to a relatively open area of mostly underbrush with some trees toward the back, but we heard it before we actually saw it. This is where the birds were hanging out, with several obvious youngsters sharpening their flying skills under their parents' watchful eyes. A beautiful pair of cedar waxwings perched in a dead tree in the distance, and we finally saw the sought-after pine warbler. That one went on my life list and Ivan's 2012 tally, making the buzzing, pesky greenheads tolerable. Sometimes that extra effort means all the difference. When we're having a less than productive birding day, we'll dedicate another five minutes in an area we haven't explored, even after we've decided nothing will come of it. Those always seem to be the times we see something really spectacular, or something we hadn't expected. Nature is like that, I guess: always offering up something when you don't expect it.